This is one of those multi-faceted novels that delivers on every criteria. Our main character, Tim, lives in a hotel and has to create his own entertainment because his parents are busy working and he has no friends and no siblings. 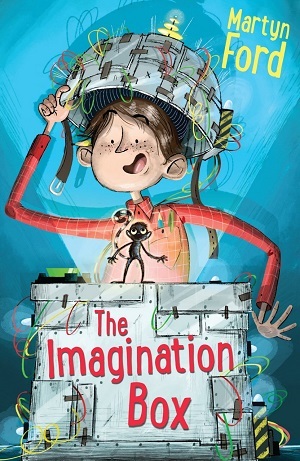 Then he meets one of the guests, a professor in a white lab coat, over a tray of forbidden cakes, and before long they are working together on the professor’s project – an imagination box that creates anything from your imagination. Tim seems to be the only one who can help the Professor to actually get the box to work – and before long Tim is conjuring all sorts of scientific magic. However, there are people who are willing to do anything to get their hands on the device, and Tim becomes embroiled in a race against time to keep the box in the right hands. Throughout his pacey adventure, Tim has to navigate the adult world, determining who is to be trusted and who isn’t, as well as experimenting with the laws of science. Of course the science in the book is completely unrealistic, but there are roots in the imagination of what we could do with science, and Martyn Ford cleverly employs space-age gadgetry and technology, as well as teleporting, to ensure that young readers are excited and motivated by futuristic scientific imaginings. The book also poses some questions. What would you create if you could create anything? What would you create if you were hanging off the edge of a ten-storey building? What would you create from your dreams? Or nightmares? Beneath all the adventure and excitement, Tim is a lonely little boy, who has to confront his deepest fears. What’s interesting is that at the start of the book we learn that Tim is adopted, and also friendless. There are deep-seated insecurities about himself here, and his relationship with his adoptive parents is barely scratched in this book – although perhaps this is to be explored in the other titles (the book is set to be the first of a trilogy, although this one works fine as a stand-alone title too). There are also themes of burgeoning friendships, and loyalty, as Tim cultivates the friendship of the professor’s granddaughter, and also befriends a pygmy monkey (although the latter he conjured from his own head). These two characters imbue the novel with laughter, which sits well against the backdrop, so that none of the story is too dark or threatening. I fully enjoyed it. It’s meaty, well-structured, and contains the right mix of elements for a sciencey adventure with humour and depth. One of those books that shows youngsters that an imagination is for stretching. For readers aged 9+.